Source – Royal London – pensions technical, 2015. This measure restricts pension tax relief by introducing a tapered reduction in the amount of the annual allowance for individuals with an adjusted income of over £150,000 and a threshold income over £110,000. The annual allowance will be reduced for individuals who have ‘adjusted income’ over £150,000 a year. The reduction does not apply to individuals who have ‘threshold income’ of no more than £110,000. Since 6 April 2016, individuals who have taxable income for a tax year of greater than £150,000 will have their annual allowance for that tax year restricted. It will be reduced, so that for every £2 of income they have over £150,000, their annual allowance is reduced by £1. Any resulting reduced annual allowance is rounded down to the nearest whole pound. The maximum reduction will be £30,000, so anyone with income of £210,000 or more will have an annual allowance of £10,000. High income individuals caught by the restriction may therefore have to reduce the contributions paid by them and/or their employers or suffer an annual allowance charge. However the tapered reduction doesn’t apply to anyone with ‘threshold income’ of no more than £110,000. Clearly the definitions of the two incomes are crucial to understanding whether someone is affected by the tapered reduction or not. Both include all taxable income. So this is not restricted to earnings – investment income of all types and benefits in kind such as medical insurance premiums paid by the employer will also be included. The difference is pretty simple; adjusted income includes all pension contributions (including any employer contributions) while threshold income excludes pension contributions. Unfortunately, HMRC’s definitions of adjusted and threshold income tend to cause a bit of confusion because they start with something called ‘net income’. A common sense meaning of this would be ‘income after tax’, but it’s not. Net income in this context is all taxable income less various deductions. 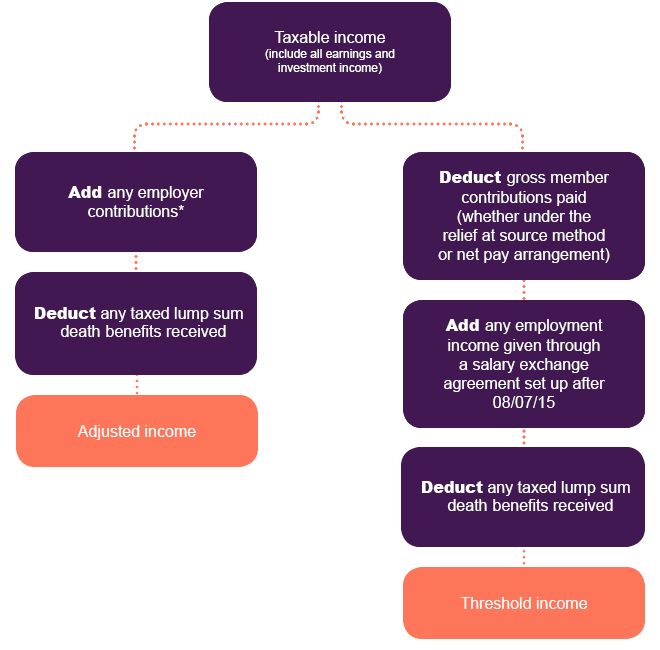 The most important (or at least the most common) of these deductions are member contributions paid to an occupational pension scheme, both money purchase and defined benefit, under the net pay arrangement. This is where the sponsoring employer of the pension scheme deducts employee contributions before deducting tax under PAYE. The other deductions are things like trade losses, share loss relief and gifts to charities. A full list of the deductions can be found at s.23 of the Income Tax Act 2007. However it all becomes a bit easier if we consider taxable income from a more practical view point. When someone says ‘I earn £x p.a.’, they don’t usually mean that that’s the amount after the deduction of net pay arrangement contributions. We can therefore assume that when someone has earnings of £160,000 and pays contributions of £20,000 under the net pay arrangement, they’ll state their earnings as £160,000, not £140,000. The £160,000 includes the pension contributions. This is therefore a good place to start for calculating adjusted income (which includes pension contributions). For threshold income, all member pension contributions need to be deducted and you wouldn’t add in employer contributions. *for a DB scheme, this would be the pension input amount less any employee contributions. Phil is a company director and sole shareholder of his own company. His taxable income is £100,000 and he decides to pay an employer contribution of £60,000 (using carry forward to avoid an annual allowance charge). His adjusted income is therefore £160,000 which would on the face of it trigger a reduction of £5,000 in his annual allowance (half of the £10,000 excess over £150,000). However his threshold income is only £100,000 and so the tapered reduction does not apply. To avoid individuals entering into a salary exchange or a flexible remuneration arrangement after 9 July 2015 so they received additional pension contributions but reduce their adjusted or threshold income anti-avoidance rules have been put in place. It is reasonable to assume that the main purpose for the change to the salary exchange or flexible remuneration agreement is to reduce the individual’s adjusted or threshold income (this includes any reductions to nil). The change affects their income in either the current tax year or two or more tax years, including the current tax year. In return for the income being reduced the individual receives an increase in their adjusted or threshold income in a different tax year. If the anti-avoidance rules apply then the income used to calculate the reduction to the annual allowance for that tax year is the one before any adjustments were made. It’s still possible to carry forward unused annual allowance from previous years to a year where the taper applies. However the amount of unused annual allowance available when carrying forward from a year where the taper has applied will be the balance of the tapered amount. Where an individual flexibly accesses their pension savings they are subject to the money purchase annual allowance. Individuals who have flexibly accessed their pension savings will continue to have a money purchase annual allowance of £10,000. But where this applies, the alternative annual allowance (normally £30,000), against which their defined benefit savings are tested, will be restricted by the same taper. This means that those with incomes of £210,000 or more will have an alternative annual allowance of £0 although any available carry forward can be added to this. If someone is subject to the MPAA as well as tapering, the taper reduces the ‘alternative annual allowance’ which applies to any DB benefits they may have. This is the standard annual allowance less the MPAA of £10,000, so currently the alternative annual allowance is £30,000. Where next for the UK Economy? The UK Economy: Artemis Fundmanagers’ CEO Peter Saacke gives his opinion on about Sterling’s recent fall and where the UK economy might be headed in 2017. Please note this is not necessarily DFM’s opinion. We do however expect to see imported inflation fairly soon, and some tough decisions for the Bank of England. M&G Feeder of Property Portfolio Fund will lift its current suspension of trading from 12 noon Friday November 4th, 2016. Trades can be placed up to 24 hours before that, for a November 4th trade date. 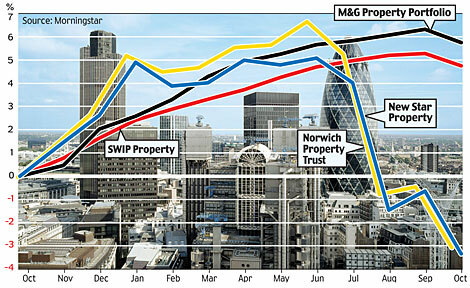 The fund of course feeds M&G Property Portfolio. It appears the main property fund which remains suspended at the current date is Aviva Property Trust (formerly Norwich Union Property Trust). M&G Feeder of Property Portfolio Fund is opening for business again! Property Funds are Opening Up Again! The following property funds will resume dealing for the valuation point on the dates stated below. LTA – Lifetime Allowance (Pensions). This is an excellent article published by Standard Life 5/7/2016. Because it is on their adviser site you cannot follow a link to it (requires login) but I have reproduced it here because it is so current on the topic of the Pensions Lifetime Allowance (LTA). Pensions may still be the best place for savings even though individuals have reached their lifetime allowance (LTA). LTA maxed out nearly? no problem. In contemplation of a happy retirement. And yet this appears to be a watershed for many. Pension funding is possibly being switched off due to approaching or reaching the LTA without a thought. But such drastic steps should only be taken if there is a better financial alternative. Of course, contributions made by those with enhanced or fixed protection would result in forfeiture, and so these clients would need more careful attention of the pros and cons before re-starting any funding. But for everyone else rapidly approaching the £1 million – should they ‘limit’ themselves or make ‘allowance’ for more funding? Let’s look at busting five common myths that may be contributing to the perception that continued funding above the LTA is always ‘bad’. Myth # 1 – Contributions must stop when you reach the LTA. The key word is ‘allowance’. It is not a ‘limit’ to funding as some seem to think. There’s nothing to prevent individuals from continuing to pay in – they still have an annual allowance available (£40,000 if not reduced by the tapering for high earners), allowing them (or their employer) to make contributions and get tax relief at their highest marginal rates. The LTA is not a barrier to pension saving or the growth on the investment, it’s the point where you have to look at what the likely tax treatment of this additional fund will ultimately mean. In this way it is no different to any other allowance such as the personal income tax allowance, annual capital gains tax allowance or the new dividend allowance – once breached, tax will be applied. Of equal importance for all employees, if funding is stopped, there may be no alternative form of remuneration on offer to replace the employer pension contribution. This can considerably strengthen the argument to carry on funding. Remember where an employer does offer alternative remuneration this will be fully taxable and the amount available to invest will have suffered income tax and NI. Myth # 2 – There is a tax charge to pay as soon as the LTA is reached. When individuals hit the LTA with their fund… nothing happens. There’s no immediate penalty, the pensions police do not coming knocking at the door. Your client just has a fund greater than the amount the allowance protects. The tax charge is only incurred when benefits are crystallised, such as when the fund is designated for drawdown. Myth # 3 – The LTA tax charge is applied when you start to take benefits. The charge only starts to bite when there’s not enough LTA to cover the fund that is being crystallised. Benefits are tested when they vest, a process referred to as crystallisation. Each time the individual crystallises some of their pension a percentage of the LTA is used, but the charge itself only comes into play when there’s no longer have enough LTA available to cover the amount being crystallised. So by phasing retirement, only crystallising enough funds as are needed each year, means that the timing of the LTA charge can be managed, at least up to the age of 75 (at which point uncrystallised funds will be tested along with any investment growth on crystallised funds). When are funds over the allowance are going to be accessed – will that be during their own lifetime or after their death? These considerations will help to predict the potential tax charge on excess funds. The charge is often expressed as 55%, but that is only payable if the whole of the chargeable amount is taken as a lump sum. If the individual moves it to their drawdown pot only 25% will be deducted (remember there is no tax free cash element). This would be beneficial if the income tax then applied when withdrawing an income is less than 40%, which will be the case for many clients in retirement who are able to control the level of their taxable income from effective management of tax allowances. There is no 2nd LTA test on death for crystallised funds. So if the client dies before age 75 their beneficiaries will be able to inherit the pot without any further lifetime allowance charges. And of course, income they take will be tax free – so the only charge incurred was the 25% LTA charge when it was originally put into drawdown. If the client dies after age 75 then the beneficiaries would pay income tax at their own rates on amounts drawn. So depending on their other income, this could potentially be only subject to basic rate tax, or even covered by their own personal allowance. Bearing in mind these points, when might it make sense for your clients to continue paying into their pensions above the LTA? One key factor will be whether your client is in a workplace pension and whether there is any alternative remuneration/reward being offered. If a contribution is coming from the employer then the cost to the employee is nil. If the individual is paying the contributions themselves, then what is the cost to them? What level of tax relief does the contribution attract? And does paying a personal contribution gain a matching employer payment? Getting an employer contribution would seem the most beneficial – no cost to the individual and a taxed benefit is better than no benefit at all (assuming the employer contribution can’t be converted into extra salary). Another key factor will be whether your client can get higher tax relief on contributions paid in than will be deducted when benefits (retirement income/death benefits) are paid out. If the contribution all gets 40% relief going in, but coming out is subject to the 25% LTA charge and then basic rate tax only, then the return is the same as if it had gone into an ISA. And given that headline tax rates are only part of the story, with effective tax rates taking the overall percentage lower, the actual cost of withdrawing the money could be a lot lower. On death, they can be passed on free of IHT to provide lump sums or pension income for any named beneficiaries. It may be that an individual does not need to rely on their pension savings in retirement, and there would be no point in taking money out and potentially exposing it to IHT at 40% on top of the other tax charges already discussed. And if the individual dies before age 75, then after any LTA charge has been dealt with, the income or lump sum would be tax free for those beneficiaries – so potentially only a 25% charge. Ultimately, having a fund approaching the lifetime allowance doesn’t mean that pension saving has to cease. A considered approach can show that there may still be reasons to continue funding depending on the client’s circumstances. And remember from April 2018 the LTA will become inflation linked so it won’t remain £1M forever. Retirement Options – How about a sensible, non-sales based guide? The Retirement Options bible is an important read for anyone planning for their retirement. 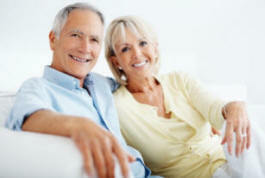 It explains the different types of retirement options available in the UK. Whenever we deal with a client concerning retirement planning, one of the first things we do is hand them a copy of our Retirement Options bible. 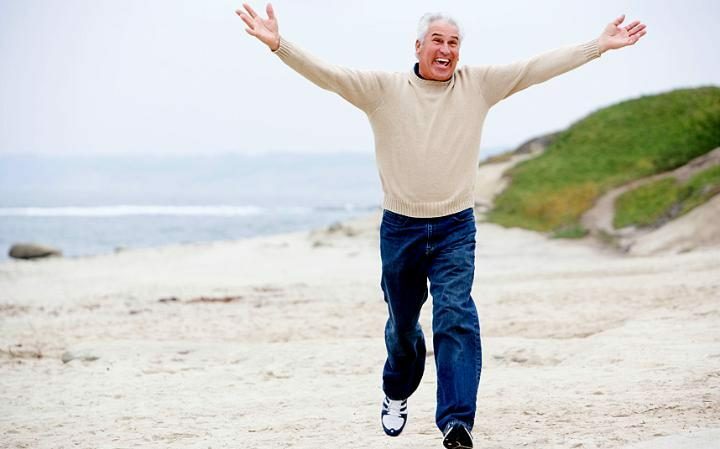 This is a completely factual guide to the different types of retirement options available in the UK and how they work. It’s not a sales aid – far from it! Written by compliance people, it might be considered a tad dull, but nevertheless it is a useful text for those who are beginning to think about retiring and how to utilise their pensions. We’re happy to send interested parties a copy for free. Just call us on 0345 013 6525 or email enquiries@dfmadvice.co.uk giving your name address and telephone number and we’ll email you a copy. All we ask in return is that you allow us a follow-up telephone call to chat about your plans and offer our services (and the first meeting is free and no-commitment required anyway). The Retirement Options guide outlines the different options available to you from your pension funds when you retire. It also provides useful information about the state pension and the benefits available from workplace pensions your employer may have provided for you. You may be aware that there have been a number of changes over the last year. This will affect the way in which you will be able to take your pension benefits. Please read the guide carefully as you consider the options now available to you. The options described generally apply to defined contribution (money purchase) pension pots such as personal pensions, group personal pensions, self-invested personal pensions (SIPPs), and stakeholder pensions. These options are not normally available to final salary pension schemes (unless transferred first to a defined contribution pension – which, for most people, is unlikely to be advantageous). members of the public please, not industry people wanting to crib from it! Standard Life has suspended the Standard Life UK Real Estate Feeder fund (all share classes) with effect from 12 noon on 4 July 2016. Following the EU referendum result the fund has seen an increase in outflows. In order to protect the interests of all investors, Standard Life has decided to suspend the fund. The suspension will cease as soon as practicable. Standard Life will review the suspension at least every 28 days. Policyholders will be notified and further updates will follow. Aviva Investors has suspended the Aviva Investors Property Trust fund (all share classes) with effect from 12 noon on Monday 4 July 2016. Aviva has been experiencing higher than usual requests to sell units in the fund. In order to protect the interests of all investors, Aviva has suspended the fund until further notice. Bright Grey has been a sub-brand of Royal London for some time, and is now being fully rebranded under the parent brand. Opinion: Bright Grey has been a pretty good protection provider, historically with competitive rates for life insurance, Critical illness cover, and income protection. Also was an early provider of “relevant life” life cover for small businesses and sole traders, as well as mainstreambusiness protection. Likewise, Scottish Provident has been part of the Royal London group for some years now, and that brand is also going with effect from today, December 1st 2015, and replaced by Royal London’s. Opinion: Scot Prov was a popular provider of protection, and years ago even provided some personal pension contracts. It’s most famous product was probably its “Pegasus” Whole of Life cover, which sold well as its early premiums (always reviewable) were low. However, as many are now finding, the trouble with reviewable premium WOL policies is they start to go up at an alarming rate as you get older. I have seen many forced to ditch the policies in later life as the premiums become unaffordable. It pays to look at guaranteed rate WOL policies, if indeed WOL is what you really want (in my opinion its main use is within IHT and estate planning). A good talk with a good adviser often sorts out the best way to go when face with this situation.